BANGI, 26 Mac. 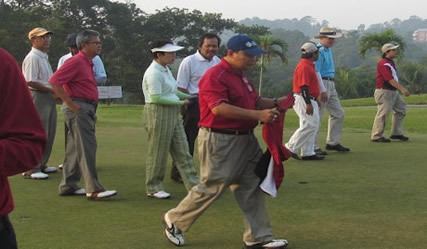 2012 – The Administrative Group with a score of 148 emerged champion in the UKM Staff Golf Championship held at the UKM Golf course in Danau here yesterday. Their players were En Abd Wahab Hashim, En Lim Chin Haw, Dr Tajul Arifin Muhamad dan En Abd Karim Che Kob. The Science Cluster represented by Prof Madya Dr Mohd Nizam Said, Hj Rosli Mohamad, Prof Madya Dr Ahmad Abas Kutty and Prof Dato’ Dr Md Ikram and the Professional Cluster made up of Dr Ruslin Amir, Prof Madya Dr Zamri Mahmood, Dr Mohd Taib Harun and Dr Mohd Isa Hamzah both with scores of 142 emerged the runners-up. Members of the Board of Directors also took part in the tournament as guest participants as a recognition by the UKM golf fraternity for Tan Sri Dato’ Dr Zulkefli A. Hassan who is being transferred to the Science University of Malaysia (USM) as chairman of its Board of directors from April 1 and to be succeeded by Prof Emeritus Dato’ Dr Mohd Zawawi Ismail. The Registrar, En Abd Aziz Othman presented prizes to 20 best individual players while the Vice Chancellor Prof Tan Sri Dato’ Wira Dr Sharifah Hapsah Syed Shahabudin presented prizes to the special guests. Both Dr Zulkefli and Prof Zawawi and members of the UKM Board of directors Dato’ (Dr) Azmi Abdullah dan Datuk Mohd Nasir Ahmad also took part.